Microsoft offer their own full MDM solution in the form of InTune which provides the ability to manage not only email, but also other company owned applications installed on the device. For some organizations they don’t need all that functionality, but still want better, modern controls. 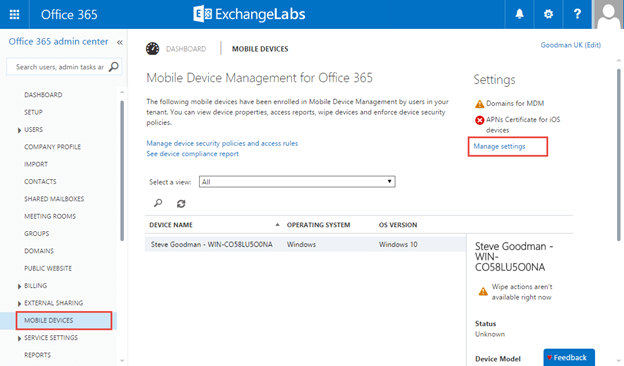 Office 365 Mobile Device Management fits the gap where ActiveSync leaves off but doesn’t provide the third-party app management ability of the full InTune product. Based on InTune, Office 365 is aimed at managing your Office 365 suite – but not anything else. It allows you to deploy and manage Office 365 apps and use advanced features for protecting content within your tenant.